Discussion in 'Addons and Resource Packs' started by MJRLegends, May 6, 2015. Note: Report any bugs/problem in this thread! Requires Galacticraft 4 Builds, (178 Build and higher) and Forge 14.23.1.2555 or higher & Requires MJRLegendsLib! Requires Galacticraft 4 Builds, (178 Build and higher) and Forge 13.20.1.2513 or higher & Requires MJRLegendsLib as of ExtraPlanets v0.5.0! Requires Galacticraft 4 Builds, (178 Build and higher) and Forge 12.18.3.2239 or higher & Requires MJRLegendsLib as of ExtraPlanets v0.8.6! Requires Galacticraft 4 Builds, (178 Build and higher) and Forge 11.15.1.1764 or higher & Requires MJRLegendsLib as of ExtraPlanets v1.1.9! Rhettorical, was700, vos and 4 others like this. Gas giants are no solid surface! Yes but how can i have a world with no blocks and have dungeons and that. Hey there. Awesome to see a new addon that allows space travel to all the other solar system planets, I've been playing around with this for a little while and wanted to help out with some feedback. 2. All mobs do not suffocate on planets. Personally I like mobs not suffocating on planets, maybe add it as an option in a config file for mobs and the player? 3. Overworld's Moon can be seen regardless of what planet you are on. Would be nice to see the Sun's proximity vary in size with accordance to what planet you are on. 4. Checked the changelog for v0.3. Are ores naturally spawning on planets yet? If so, they are not. 5. Adding craters to Mercury would be neat. 6. Everything on Uranus, including surface rock blocks and blocks placed by the player (except bedrock) eventually turns into ice, causing some lag issues. Just some suggestions and a few bug reports, hope they help. 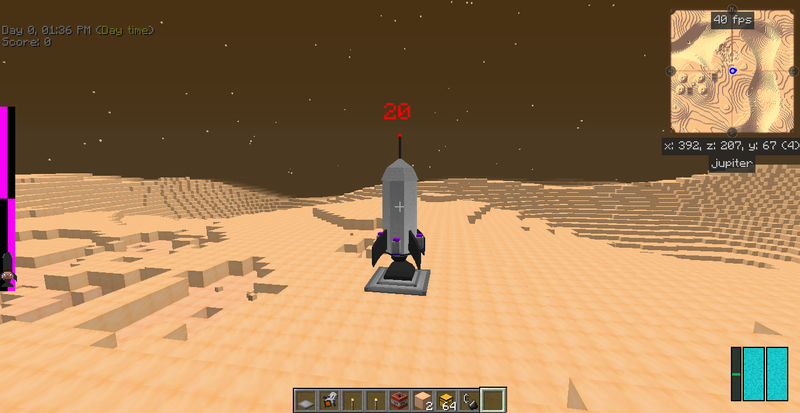 Also this mod seems to work well along with More Planets as well, allowing players to fully explore two solar systems. This addon looks very promising, I'm enjoying it in it's early stages. Hope to see further progress. I see the ores spawning now. 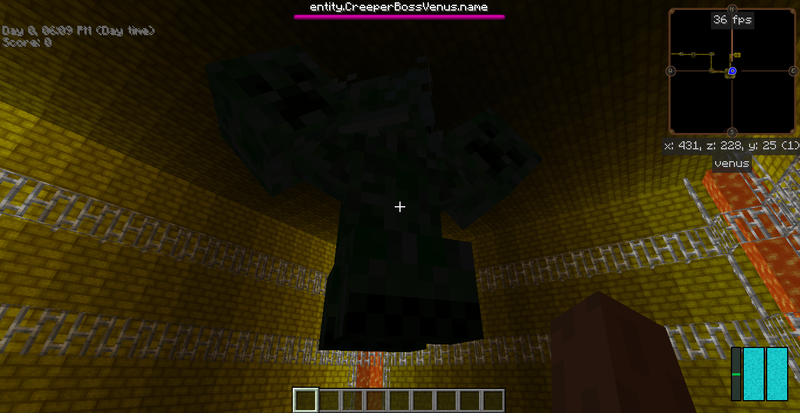 About the Creeper Boss, I tried in survival and it has the same result; gets stuck on the ceiling when it spawns. It only gets unstuck when I nudge it. The Creeper Boss drops down normally on Mars. as long as it attacks you and you can kill it, then it will do for now as they are only place holders atm as i plan to add custom bosses in later versions. Sounds good, everything else with the boss works perfectly fine. Looking forward to the future updates. I like the new sky visuals. Will you be adding Pluto as a tier 8 rocket required planet? Glad to hear you like it and probably not it will be tier 7 as i got other plans for the tier 8 whichever your see in future updates. Nice. I see in the changelog you're adding some of the other dwarf planets too. Another bug report (unless this was already fixed in an upcoming update). The player does not take suffocation damage (like mobs) even without oxygen setup while on other planets. Thermal Padding still works correctly.